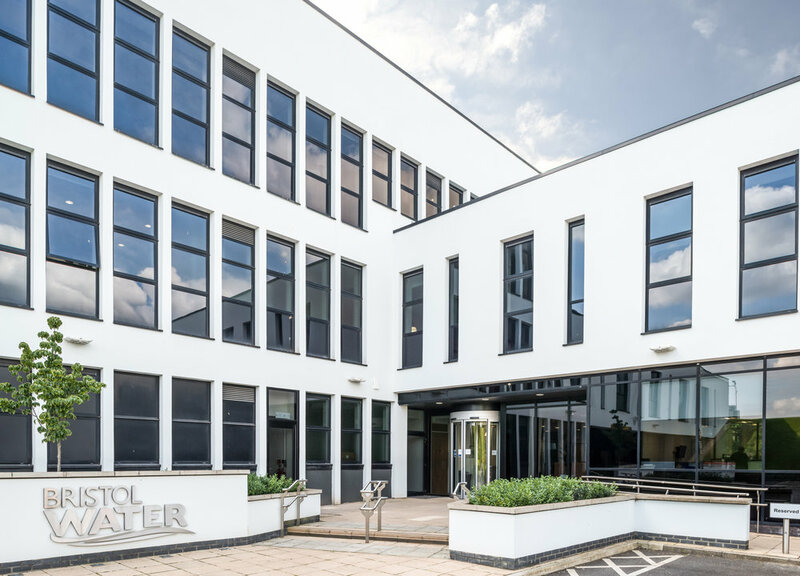 In 2010, a plan to extend and refurbish the Bristol Water’s Head Office building at Bedminster Down was revived and the first phase of external enabling works and over-clad commenced in early 2012. Bristol Water had decided to rationalise its building stock by disposing of their Bedminster Down Depot site and relocating approximately 180 network maintenance staff to head office. The iconic 1963 structure was initially over-clad and re-roofed before a two storey wing was added, supported on tapering columns over the rear carpark. A progressive decant of occupants into a new build extension allowed a full re-service and refurbishment whilst the building remained in occupation. On completion, two hundred network staff joined their colleagues under the same roof for the first time to enjoy the stunning new facilities. gcp’s relationship with Bristol Water goes back to 1999 when we embarked on the design of a new fishing lodge at Chew Valley Lake. Opened by the wonderful Bernard Cribbins, the project was a great success and led to more direct commissions including an angler’s shelter at Litton and store buildings at Barrow and Kingswood.